Are you recruiting on demand as the need arises or are you making investment in recruiting ahead of demand? The most successful companies invest in the talent communities that matter for their strategy, and do so primarily for the good of the talent community itself. 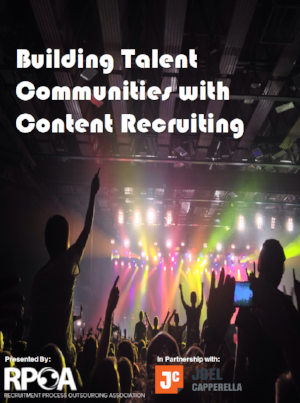 An inbound or content recruiting strategy allows your company to focus talent development as if people mattered. This eBook will help you identify how to begin to tell your story of employment to the talent communities that matter most to your business and ultimately amplify your recruiting efforts, employment brand and employee engagement. How to consider the story of your company. How the story of your company impacts your employment brand. How to develop your story, find the inherent drama of employment and connects with the right audience. Why investing ahead of talent demand ultimately decreases your cost per hire. How a strong employment narrative can improve retention and talent development. Joel Capperella helps business and marketing leaders raise their marketing game. His organization, Capperella Strategies, LLC helps companies understand the deeper meaning and impact their products and services have upon the marketplace and empowers them to tell that story broadly, and connect that story to the sales process. Building the habit of connecting story to sales helps clients of Capperella Strategies get crazy amounts of awareness, a bigger pipeline, faster revenue, and empowers the company to transform how they recruit top talent. Capperella Strategies works best for teams that are looking to get more out of their content marketing, PR investment, creative agencies, recruiting efforts, and helps build greater employee engagement, customer advocacy and empathetic leaders.